Sheikh Hasina won 288 out of 300 seats as The opposition claims some 15,000 of its activists were detained during the campaign, crushing its ability to mobilise support. 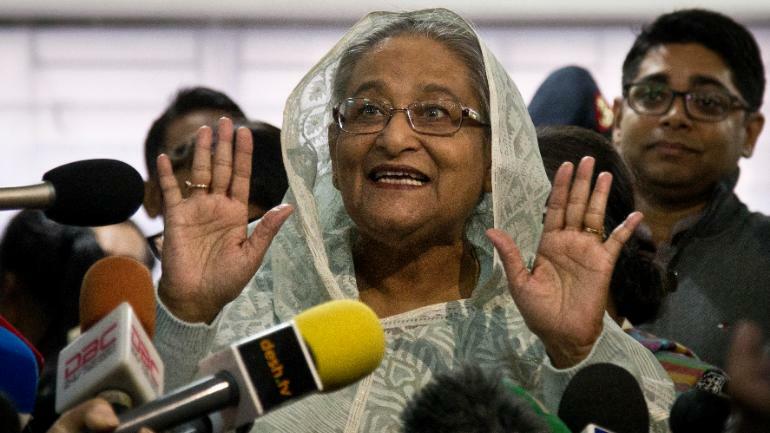 Bangladesh Prime Minister Sheikh Hasina was declared the landslide winner Monday of an election marred by deadly violence as The opposition has slammed the election as “farcical” and claiming that it was rigged. The election was one of the most dominant displays of democracy in action, which hands a huge majority to the Awami Party. Hasina´s ruling Awami League party and its allies won 288 seats in the 300-seat parliament, with the main opposition securing only six seats, Election Commission secretary Helal Uddin Ahmed said. Sunday´s vote, which hands Hasina a record fourth term, was overshadowed by clashes between rival supporters that killed at least 17 people and allegations of ballot box stuffing and intimidation at polling stations. Hasina´s government had mounted a crackdown on the opposition, an alliance led by the Bangladesh National Party (BNP), which urged the country´s election commission to void the results. “We are demanding that a fresh election is held under a neutral government as early as possible,” Kamal Hossain, who heads the alliance, told reporters. Deadly violence that blighted the election campaign spilled over into voting day, even as authorities imposed tight security with 600,000 troops, police and other security forces deployed across the country. The opposition claims some 15,000 of its activists were detained during the campaign, crushing its ability to mobilise support. Thirty-five of its candidates were either arrested over what they said were trumped-up charges or disqualified from running by courts, which Hasina´s opponents say are government controlled. Thirteen people were killed in clashes between Awami League and BNP supporters, police said, while three men were shot by police who said they were protecting polling booths. An auxiliary police member was also killed by armed opposition activists, according to officials. The United States and the United Nations raised concerns about the credibility of the election while Human Rights Watch and other international groups said the crackdown had created a climate of fear.